These days, even large-format displays are within the reach of those on a budget. There are plenty of 27-inch screens available at an affordable price, and the quality is going up. Take BenQ's fashionably slim GW2760HS, for example. Priced at €279 (around £240 / US$367 / AU$396), it's packed with features and puts in a performance we couldn't have realistically expected from a budget monitor just a few years ago. The BenQ GW2760HS has some very capable rivals. The Iiyama ProLite XB2776QS, released earlier this year, has a higher resolution and a great picture quality, and is only slightly more expensive if you shop online. The Samsung Series 8 S27A850D combines the best of PVA and IPS display tech to create a very capable and versatile monitor, and the Hanns.G HZ281 boasts a 28-inch, 16:10 aspect ratio screen. And if you're after a passive 3D display, the Philips Brilliance 278G4DHSD has a 27-inch IPS screen and even a USB 3.0 hub. The BenQ GW2760HS is easy to assemble, though you need a screwdriver handy. Overall build quality is good, but it's not as versatile as BenQ's other recent release, the 24-inch BL2410. You can tilt the screen forward and back, but you can't rotate it into portrait mode, the height isn't adjustable and it doesn't swivel on its stand. It's light and robust, but it wobbles a little if you bang your desk too hard. It's VESA-compatible, though, so if you don't want it on your desk, you can wall-mount it instead (brackets not supplied). Your connectivity options are DVI, VGA or HDMI, so you can connect the BenQ GW2760HS to just about anything. There's an audio-in socket to use if your video connection doesn't also carry audio, and a headphone socket so you can use your display without disturbing everyone else in the room. It's surprisingly feature-rich for a budget display, too. Preset calibrations include a Reading Mode, which sets the monitor's colour temperature, brightness, contrast ratio and sharpness to mimic the paper used in paperback books, which is much more comfortable for reading your ebooks. It's also the first in BenQ's new range of Eye-Care monitors, featuring a flicker-free backlight to reduce eye strain, fatigue and headaches. Eco Mode adjusts the backlight brightness level to conserve power. When browsing the internet, emailing and general computing, power consumption is reduced by around 37%, with this figure increasing to around 44% when gaming. And naturally, the BenQ GW2760HS's resolution is full HD, with its 16:9 widescreen ratio ideal for watching movies. The BenQ GW2760HS's 3000:1 native contrast ratio and 20M:1 dynamic contrast ratio prove their worth when looking at static images. Pictures are displayed with real depth and detail, with skin tones sympathetically reproduced and colours looking bright and vivid. In our gradients test, colour ramps were smooth and consistent, without a hint of banding. The monitor also did an excellent job of distinguishing between black and near-black, and between white and almost-white. A lot of monitors struggle with this test, with a grey that's only 5% black appearing indistinguishable from pure white, or a 95% black looking totally black. There were no such problems here. Viewing angles are equally impressive. We're promised you can view the screen from anywhere within a range of 178 degrees without the colours shifting, and the BenQ GW2760HS lives up to this promise. Wherever you are in the room, you can see the display with colours reproduced as accurately as if you were viewing them head-on. Lighting consistency is good. It's not quite perfect - it's a little uneven at the very edges of the screen - but unless you're a professional artist or graphic designer, you'll hardly notice. The flicker-free backlight is more than just a gimmick, too. 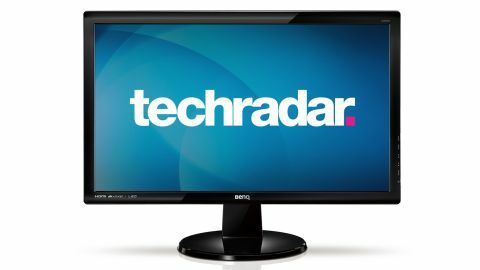 According to BenQ, standard monitors' backlights can flicker at 200Hz a second when brightness is reduced from its maximum level. Although this is imperceptible when using the display, the eye strains to adjust to the almost invisible flickering, causing fatigue and headaches. BenQ's unique De-flickering Backlight Circuit Controller eliminates this flicker, making it easier on the eyes for prolonged use. To see it in action, simply take a digital photo of the screen, and compare it to a photo of a standard monitor. The picture of the regular display shows wavy lines caused by screen flicker, while BenQ's flicker-free model looks fine. Text reproduction is acceptable, but nothing to write home about. Although it measures up well against other monitors in this price bracket, it lacks the clarity offered by more expensive screens, making it difficult to read at low point sizes. It's great for movies, displaying moving images without ghosting, but budget displays rarely impress with their audio quality, and the BenQ GW2760HS is no exception. Volume is weak, and the overall sound is flat and lifeless. You're much better off muting its integrated audio completely and hooking your computer up to a decent set of external speakers. Displays at the cheaper end of the market are improving in quality. Naturally, there are some areas where this 27-inch display can't compete with its more expensive rivals, but overall, it puts in a performance that belies its price. You're certainly getting a lot of monitor for your money. You can't fault the BenQ GW2760HS for style. Its minimalistic approach is appreciated, with a slim bezel and all-black design that doesn't detract from what's on the screen. Its flicker-free lighting makes it ideal if you use your monitor for long periods. It's excellent at reproducing images too, with great colours and very good detail. Viewing angles are superb - you can view this screen from anywhere in the room - and it's fine for HD movies. We appreciate the VESA compatibility too, so you can wall-mount it if you wish. There wasn't a huge amount to dislike about the BenQ GW2760HS. Text reproduction could be better, though it's not bad compared to other displays in its price bracket. We miss the height adjustment and swivel stand offered by BenQ's own BL2410, and its audio is no better than most budget monitors - ie it's terrible. The BenQ GW2760HS is a capable and feature-rich display that doesn't disappoint. If you get headaches or eye strain after looking your a monitor for too long, you should try this flicker-free alternative.